I'm putting two Peel Sessions up today. One now, one in a few hours or so, so make sure you check back later to get that cos its a goodun. First up is a session from Interpol, which was recorded on the 18th March 2001. It was produced by Simon Askew and would be the only session that the band would get to record for the Peel show. 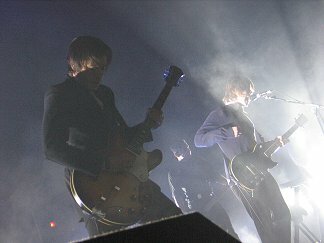 Of the four of these early versions, NYC would go on to first appear on the Interpol EP in June 2002, and then along with the other three songs would eventually go on to feature on the band's 2002 debut album Turn On The Bright Lights. Enjoy.